The 2013 floods in Cambodia covered almost half the country and affected nearly 1.7 million people. More than 50 people lost their lives and hundreds of thousands more were left homeless. Research from BBC Media Trust following the incident stated that “more than a third [of people] received no information about the event that had affected them and three-quarters of those who did only received information during or after the event.” People in Need Cambodia, a non-governmental, nonprofit organization, has developed the Tepmachcha flood detection units as a means to improve the existing methods of flood forecasting and early warning in Cambodia. Designed by Robert Ryan-Silva from DAI in the US and with funding from USAID’s Development Innovations project, Tepmachcha is a solar-powered, GSM-enabled, sonar-based stream gauge, built on open-source technology. At pre-determined intervals, the device uses sonar detection to measure the height of the water at its location and sends this data over the cellular phone network back to a centralized web dashboard. This web application compares these data points against two pre-determined values. If a dangerous ‘warning’ level of water is detected, the system automatically sends out a mobile alert message to people in the affected areas. Every minute is vital in a flooding scenario. Prior to the rollout of these devices, water monitoring was done manually and the time from alert to message dissemination could be hours, if not days. With the Tepmachcha units, warning messages are now sent to registered users almost instantly. Early warnings allow people to prepare themselves, their families, and their livelihoods for the oncoming water. This could mean evacuation to the nearest safe site, or staying in their homes and securing their most important possessions; the extra time to prepare can be a matter of life and death. Amazon Web Services (AWS) is an essential part of this solution. The Early Warning System platform is hosted on AWS Elastic Beanstalk instances, as is the Interactive Voice Response service, which sends voice messages to users’ mobile phones. This system would have been far more difficult to configure in the past, and it would have been much more expensive to build in the surge capacity that the system needs. When an emergency occurs, we need the auto-scaling features that AWS Elastic Beanstalk provides to send messages to our more than 50,000 registered users. AWS also provides the stability and performance needed for the system, which cannot afford to go down at the inopportune time. Three Tepmachcha flood units have been installed over four months in some of the most flood-prone areas of Cambodia. (Data collected from these devices is publicly available here). 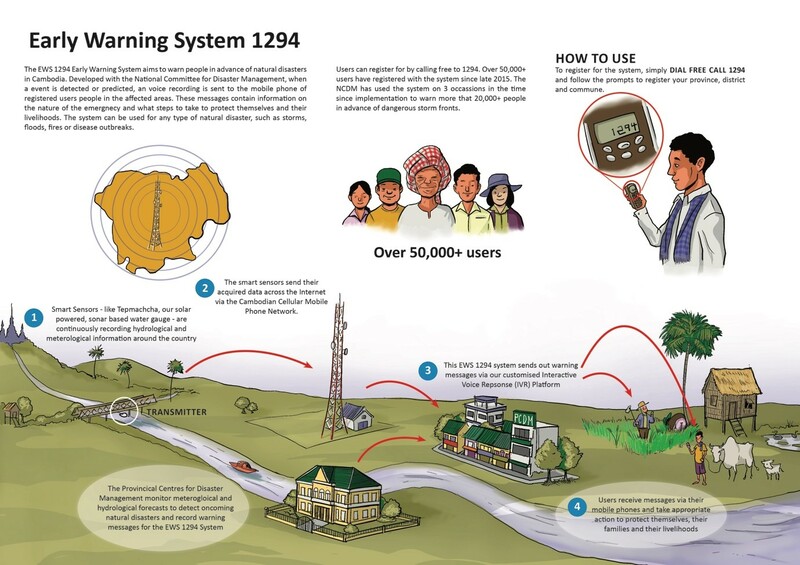 Not only can this information be used to warn citizens in the impact zone of an impending flood, but the data is also helping provide insights into water levels over time in Cambodia for the National Flood Forecasting Office. We anticipate that this information will allow for even greater predictive flood forecasting in the future. The second prototype version of the Tepmachcha units is currently under development. This update will allow for over-the-air updates to source code deployed on the devices, something that will save both time and labor. 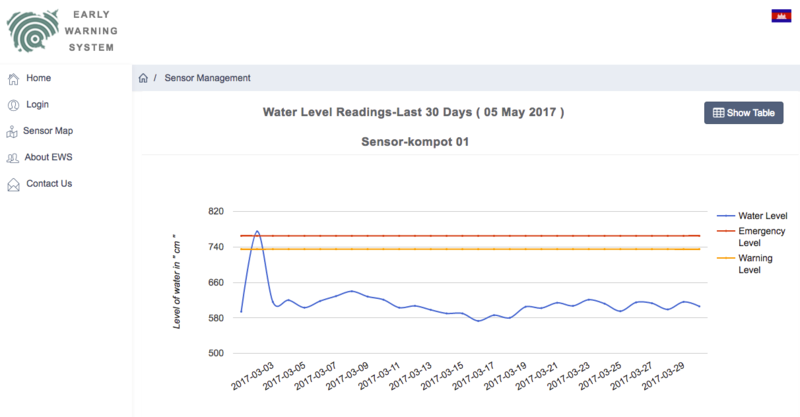 We are looking at utilizing the AWS IoT service for management of the sensor data, as the service offers even more functionality and ease of use than creating a standalone web application. We plan to install more of the devices in the future, as we continue to aspire to protect the lives and livelihoods of even more Cambodians. Learn more about the power of IoT at the AWS Public Sector Summit June 12-14th in Washington DC with C3 IoT and AWS. Register here.